We use the cover when reheating left-over food and are very pleased with a no-splattered microwave. The cover is easy to clean with a paper towel. I don't use it on defrost because my microwave book says if you cover stuff then holding in moisture that is supposed to escape actually starts cooking the product. I found this to be true. An extra I wasn't expecting.... the condensation that runs down to the turntable makes it really easy to wipe off and keep cleaner! I mostly use this to prevent food splatters. I bought 3 because one was a gift and I knew when my friend saw mine she'd want to buy one... so I sold her the 3rd one. I'm ordering 1 or 2 more for gift or backup. This is by far the best microwave food lid I've used yet. The handle makes such a difference. The best microwave cover I ever purchased because of the great Handle on it and it's high enough so not to touch the food either. 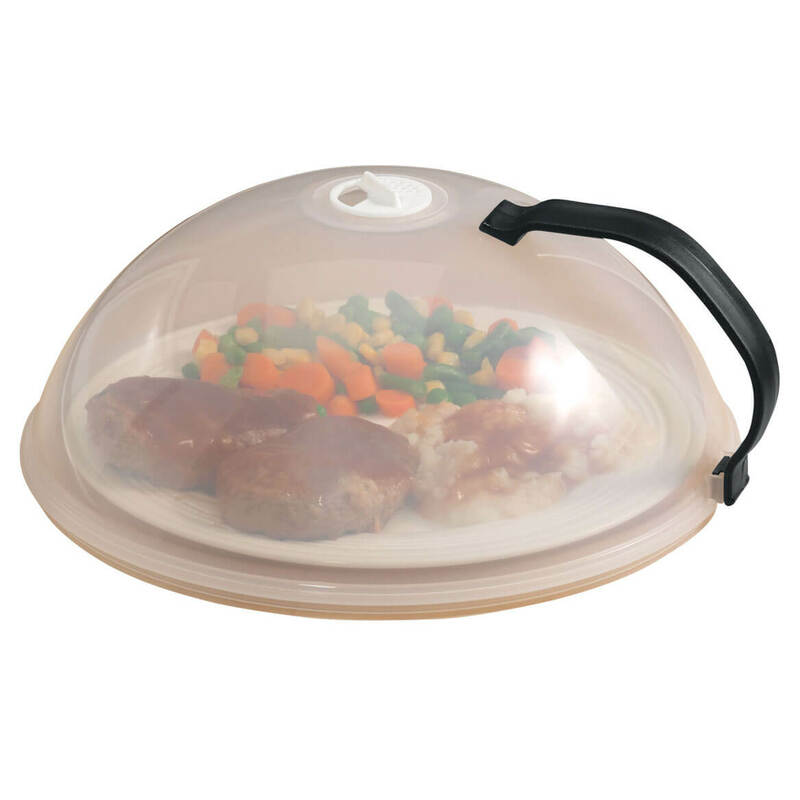 As I don't want any plastic touching the food being heated, I prefer domed covers. This cover has a vent on top instead of holes all over the cover, thereby negating the possibility of food splashing on the walls of the oven through the holes. It also has a handy handle to grab the cover. The only improvement I can think of is if it was just a tad larger. Otherwise it's perfect. We like this product very much and have ordered an extra one in case this one wears out or gets broken so we are not without it. Simply amazing. I just got a new microwave and this cover really keeps food from splattering all over the new oven. I like the size and the fact that it has a handle on it. This is nice and high so that it doesn't sit on your food. It also has ventilation for the steam to escape and the handle is great. You don't have to worry about burning yourself. I have 2 and my sister loved it so I bought her one. I usually have several covers, but have not had one that is as convenient as this one. I cook several times a day, and whatever goes in the microwave has this cover on it. It really saves on having to battle cleaning the microwave. I loved using it so much, that this is my second oneee I have bought! I like the dome shape; this way the cover don't touch the food. It is splatter-free. It seems to be easy to clean. I also like the easy-grip handle--no chances of touching it and getting burned. I USE IT FOR ALL OF MY MICROWAVE USES. IT FITS VERY NICELY ON THE TURNTABLE. ALSO FITS NICELY OVER A DINNER PLATE. NO MORE SPATTERS!!! WHEN NOT IN USE, JUST LEAVE IT IN THE MICROWAVE, OUT OF THE WAY. It is a lot easier to clean than the inside of a microwave oven. I like this cover for the steam is not burning my hands anymore. This had really made heating up foods much easier. I store it in my microwave so it's ready to use the next time I need it. I like the venting system and the fact that it's easy to clean. I used to use paper towels to cover my food, however this purchase saved me money on buying the paper towels. I usually prepare food just for me but recently I hosted a dinner party and was able to prepare some of the food the day before. Then I just reheated it. Saves, time, money, and work. Great Product. I like the way it makes splatter clean up so much easier! I was worried about storage but I just clean it and throw it under the cabinet below the microwave. Just what we needed, works GREAT!!! we used to cover left overs with paper towels, a perforated piece of plastic, or various other things to keep the splatter from dirtying up the microwave. 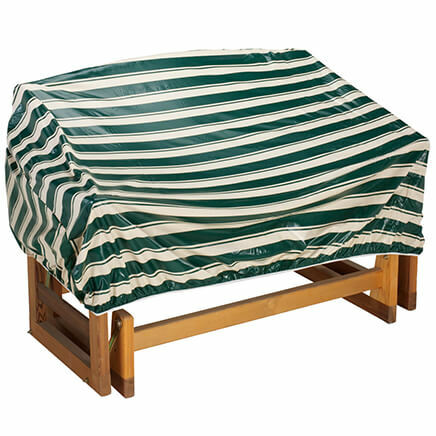 Now this covers any product we need heated with no mess and then a quick rinse and it is ready for the next job. My husband is paralyzed on his left side and has trouble handling other microwave plate lids with small handles. This one did the trick. How Did I Ever Get Along Without This Product??? I was so pleased with the Dome that I re-ordered some to give to friends. Also gave one to my bachelor son, who uses the microwave exclusively! I've been looking for a better microwave cover, one without a handle indented into the cover itself. This one is exactly what I was looking for. Works great, easy to clean, easily accessible handle, covers plates and bowls well, and I like the height. 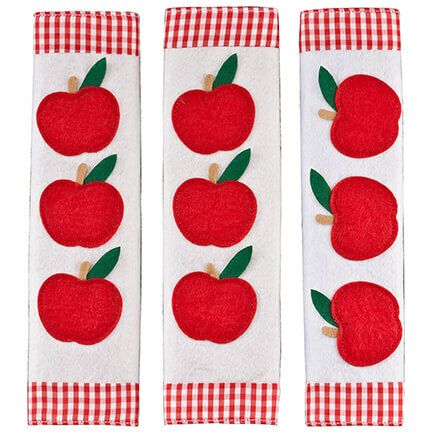 This splatter guard's tall height and domed shape makes it perfect for taller items you might place in the microwave. Other spatter guards are too short and would be frequently touching the food. This microwave cover works so well, I bought two more as gifts. 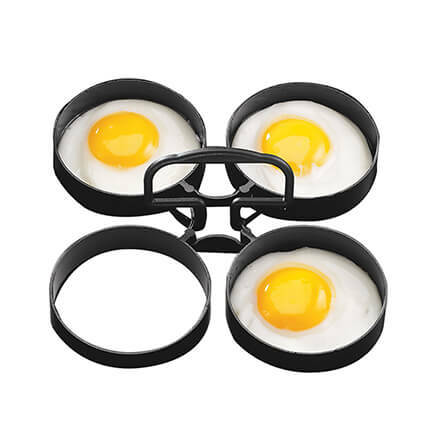 This is by far the best of 5 different food covers for the microwave that I have tried. The handle is what makes all the difference. I have actually ordered another one just in case this one gets damaged some way. Wouldn't want to do without it for even one day! 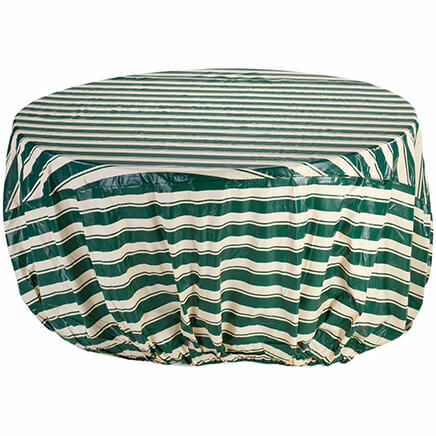 This cover is easy to find in my kitchen as it stands out.Can be used to cover other foods on table if not in use as opposed to saranwrap.May order for family members. This cover is great to use in the microwave..it's high dome gives you plenty of room to cook many things other covers would smash and make a mess of. Love the handle too, instead of grabbing the cover. Good idea. Saves paper towels and saran wrap for covering food. Also like handle. Great if plate is flat! I was disappointed that it would not cover my regular dinner plates which are not completely flat. But, it works well for smaller plates both in the microwave and frig. This does cut down on the mess if certain foods tend to blow up. It takes much longer for the food to cook then when it isn't used, doesn't heat evenly. I only use with foods that tend to explode. It is easy to clean. The vent keeps food from steaming while reheating and the handle protects my hands. I ordered this item because I had ordered the same item from Miles Kimball in the past and liked it very much. I melted the one I had by putting it on a hot burner so I needed a new one. I have an earlier version of a microwave lid and it saves dealing with cling wrap, which I never like to use. I like to cover what I heat in the microwave so that I don't have splatters all over the inside of the microwave. Have used it and it works. I like the idea of the larger size and the big handle. I love shopping here,I can always find what i'm looking for. The handle keeps all steam from getting on you while removing item from the microwave.I already have one,but when my friend saw mine,she remarked I sure need one of those.So now she is getting one ,as soon as it gets here. Love this to prevent food all over the inside of the microwave. Fits all size plates and bowls too. because it works and keeps my micro clean. THE PLATE COVER WORKS GREAT, HAVE USED FOR OVER A YEAR. Had one previously, absolutely love it. It has a handle instead of the twist knob on most micro wares where you burn your hands. wanted something to keep microwave clean. To replace one that wore out. This style is different as I couldn't find the other style I had for years. To keep food from splashing all over. I just want something to cover left over foods. I had two so I'd have one to use when the other was in the dishwasher. Somehow one is missing so I'm replacing it. Couldn't do without it. I love this thing. Use it every day for nearly everything. Keeps the microwave clean!! To replace the one that I had. I use it all the time! Helps keep the micro clean. don't need to use disposable covers. Tired of cleaning the microwave. A friend gave me one and I was looking to purchase another. I googled and was directed to your site. hopefully protest my microwave from a undesirable mess looks durable and will make a fashion statement. I have many microwave covers, but none with a handle. I picked this item because we microwave leftovers often and this item will help keep the microwave walls clean. My mother in law bought one from your company. She loves it and suggested to me. It is a great idea. I often time use a piece of paper towel to cover the food when heating. BEST ANSWER: Thank you for your question. Yes, the Vented Microwave Cover is BPA free. We hope this information will be of help to you. BEST ANSWER: It fits over a standard plate. It measures 10" across and approximately 4" to 5" high. We use it all the time and is the best that we have found. It has a 10 inch diameter. It covers a large dinner plate with space. It is the best cover that I have ever used. Thank you for your question. It is 10" diameter x 4" high. We hope this information will be of help to you. My plates are a little larger than standard and it works fine sitting on the edge of the plate. It is about 10" in diameter, and about 4-1/2" high. Does the handle stay attached? I brought 2 of them and one has and other one did not. I believe it does stay attached. Yes it stays on tight. 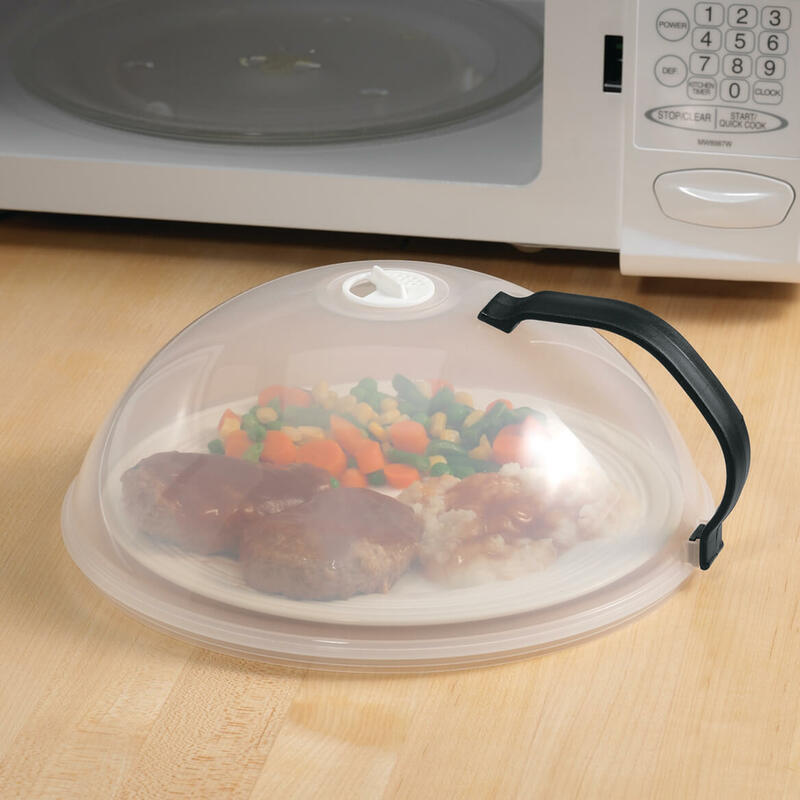 How long can this food cover be in the microwave (on high power) without the dome or handle becoming disfigured? 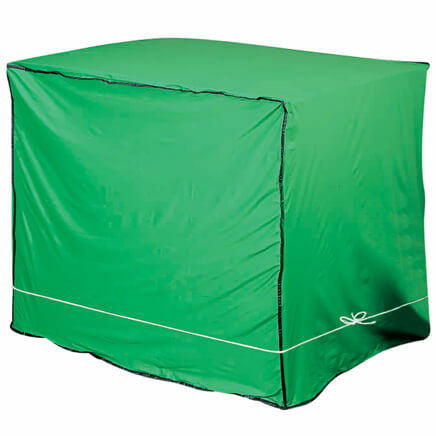 BEST ANSWER: I have not had any problems with this dome cover. Length of time, huh well I know it's been on over 6 minutes at one time and have not had any problems. I like it a lot as is it keeps the splatter down in the microwave. Would recommend this dome. I have had this dome for almost a year. I have never had a problem. I only use the microwave to reheat and cook frozen meals. It keeps the microwave cleaner. I love mine. At that price worth a try. Happy Holidays. I use it mostly for warming things up. I've used it as long as 5 minutes on full power. I've had mine for a few years and it is still like new. My sister also like them so I ordered her some. BEST ANSWER: I believe it is, it washes very good no staining. I use mine every day & recently bought 2 more for family!! Thank you for your question. Item is BPA free. We hope this information will be of help to you. BEST ANSWER: Thank you for your question. The Microwave Lid With Vent is made in Taiwan. We hope this information will be of help to you. Mine states, it was made in Taiwan.